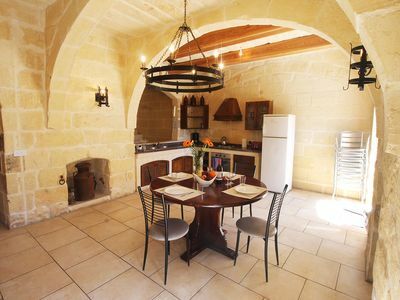 This sunny farmhouse sits in the popular St Thomas Bay close to two sandy beaches in Marsascala. This property accommodates 7 persons in 3 bedrooms. If more than 7 persons we have a groundfloor apartment that sleeps another 5, so kindly await our quotation for the number of people staying. 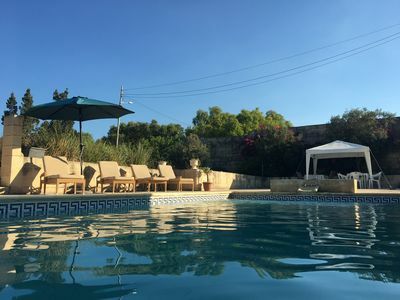 Nestled along a country lane overlooking the sea and valley the house offers fantastic panoramic sea views and is surrounded by a well-maintained garden with an outsized swimming pool overlooking the vibrant Maltese countryside. Both the pool and surrounding gardens are private and not overlooked offering maximum privacy throughout. The property is located in a valley at the foot of a hill where you can sit and enjoy a nice local bottle of wine on one of our terraces in the sea breeze or just relax, read a book or sunbathe. The pool is surrounded by a decking area with sun loungers and an adjacent open dining area - ideal for alfresco meals with umbrellas and a barbecue. A wet room is also located next to the pool. There is a lovely trek alongside the cliffs next to the house and there is plenty more to see in the area. Your stay with us will be as comfortable as possible - we are available 24/7 for all your requirements. 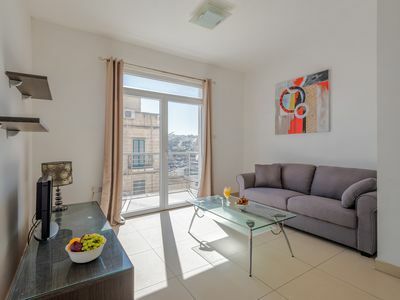 Amenities - Our property is equipped with a fully functional kitchen, free wi-fi and cable tv, a set of towels (one large and one small) for every guest staying and a welcome pack including fresh Maltese products on your arrival. Information booklets and books about Malta are also available, plus an extensive collection of reading books for you to enjoy while sunbathing. Property is accessible from the same gate/entrance and there is enough parking for 8 cars around our property. A car would be ideal but not necessary as shops are within walking distance from our place. Scheduled bus services are also available to both the airport (15 minutes away) and Valletta. All this makes the house a very special place to enjoy your holidays with friends and family. Tranquility, relaxation and authentic Mediterranean lifestyle are 100% guaranteed. We have airconditioning available in the main bedroom only. Other bedrooms have electric fans available. SAINT JULIAN’S 2 BEDROOM FLAT WITH BALCONY – NEAR THE SEA! 2 BEDROOM SAINT JULIAN’S FLAT WITH PATIO – NEAR THE SEA! 2 BEDROOM SAINT JULIAN��S FLAT WITH BALCONIES – NEAR THE SEA!